In the previous episode, we connected a data-source to our application so that our data can be persisted to the cloud. We can start to interact with our APIs and know that our data will not be lost and we can start to build meaningful interfaces. However, we discovered a potential security issue that we need to deal with, which will do in this episode. In this episode, we will deal with this very important issue of managing your application’s credentials. Having our username and password in our code (and therefore, likely to be committed to a public repository) makes our application vulnerable. Let’s look at how we can alleviate this issue. It is good practice to have your environments as consistent as possible. The reason being: when you promote your application from your local development environment to a staging environment and eventually to a production environment, if all of the environments along that path are very similar and consistent, we shouldn’t have any surprises or unexpected behavior introduced through our deployments. Therefore, we will use the same Cloudant DB instance for both local and production environments. Note: As we get further along in our development, we would create a database just for production data to keep development changes from introducing instability; but for now, we will just use the same data-source. 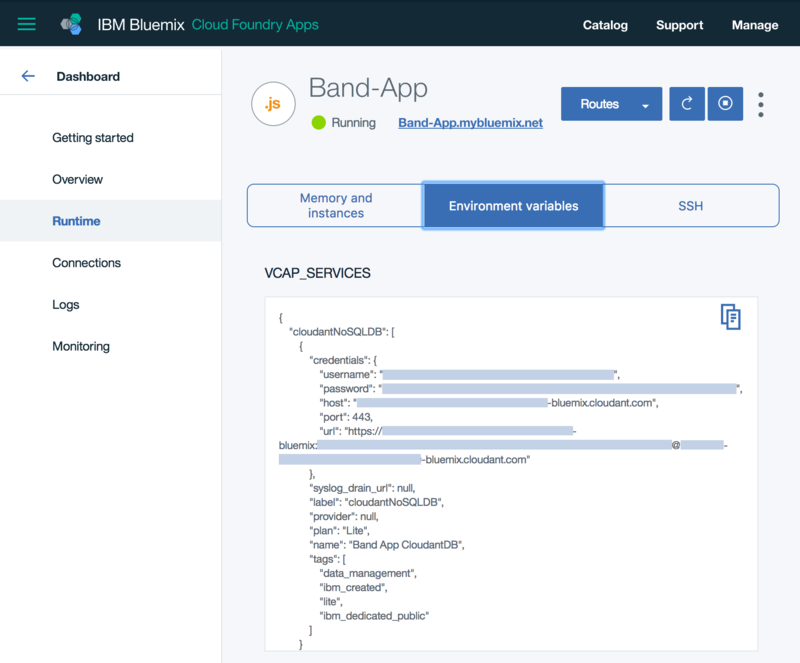 Cloud Foundry apps can pass credentials and other environment variables to the application by way of VCAP_SERVICES. Bluemix provides this functionality which we will integrate it into our application. 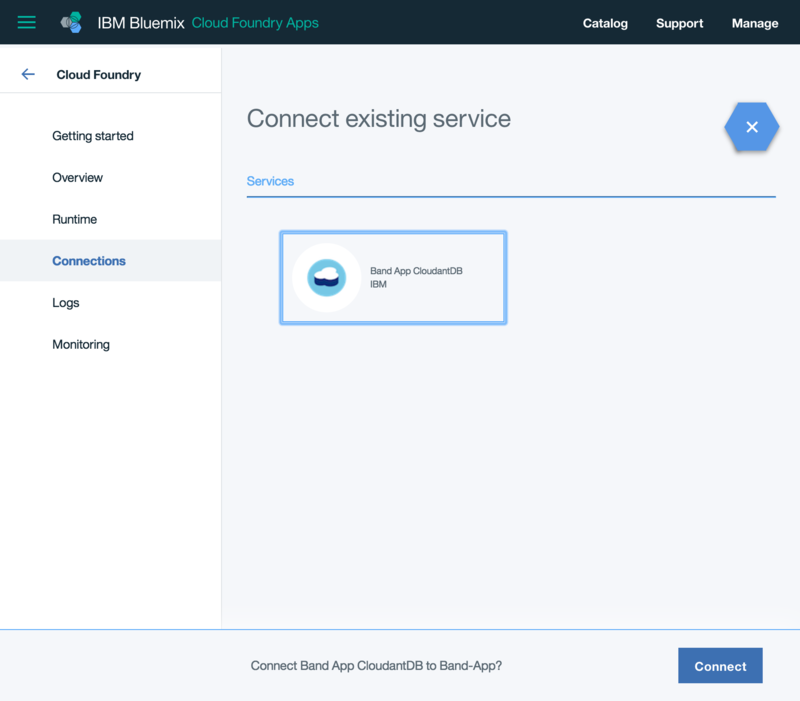 The first thing we are going to do is connect our Cloudant data-source to our application in Bluemix. We will then be able to take the “production” settings and use them in our local development environment. 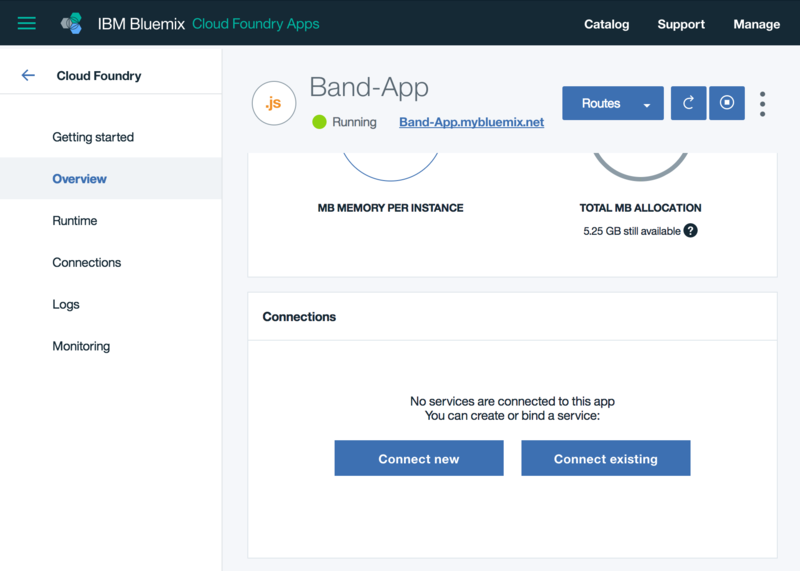 Upon connecting, we will need to restage our application to make that connection “live” on Bluemix. Note: there was an option to connect the Cloudant DB to our app when we created the service, but it seemed like a good idea to wait until now to introduce the concept. At a minimum, we should see our recently connected CloudantDB credentials here. We could also store other environment specific variables here as well, if we needed them. Let’s copy that entire code block with all of our credentials. Now that production is set up and we’ve copied the information for our CloudantDB, we will need to store this information locally. Let’s create a file called env.json and paste our credential data into it. Before we go any further, let’s add env.json to our .gitignore and our .cfignore. Open each of those “ignore” files and add “env.json” to each. Have our local application use the credentials from the local env.json file for development. Above, we are simply getting our data-sources object from the env.js file and it works for both local and production. Huzzah! Once loopback-boot (one of LoopBack’s dependencies) v3 is released, we could just use datasources.js and not need two different environment-based files, which are both identical in our case. Okay, now that we have our secrets hidden, let’s get back on track and onto an aspect to our application that I find highly valuable: Continuous Integration & Deployment. In the meantime, we can start to play with a UI interface to our data and APIs. The pieces are there and the data will be persisted. Integrating CI/CD will allow us to commit changes to our application which will trigger a new build so we can quickly test those changes in a real way.